Sold as Pair with Large Flat Washers & a Sticker! 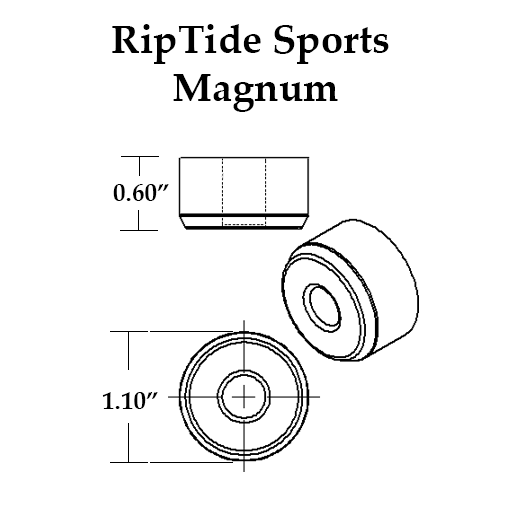 Choose the Magnum shape if you're using Paris Trucks or any truck that has a slightly larger bushing seat. The slightly larger shape will fill that seat snugly, thus eliminating the chance of dead-space or slop that can result in a weird, not-in-full-control feeling. The Magnum shape itself is more along the lines of the FatCone in that it offers more stability and resistance to lean which in turn gives a super 'plush' feel to your setup. Use boardside and combine with the Canon shape for the best experience! I used to run purple 87a on my loaded poke, but and just switched to 90a boardside magnums and 87a roadside cannons. The 90a bushings provided a lot of stability while the 87a made it easy to carve. I'm also not a hundred percent sure how the bevels on the magnums work, but I like how it feels more than barrels boardside. It's like you break into carves better because of it, yet you still retain a lot of the stability due to the nature of the shape not being so different from the cannons. I'd say bushings are one of the most important components of a board which means you need quality bushings for a quality rode. And these are quality. There are certain milestones in life. From losing your first tooth, to your first love, to your first child, there are moments that change everything. These moments change your outlook on life, changing you forever. Well, one of those moments was when I put KranK bushings into my trucks. For reference, I weigh 190lbs (on a good day), I'm 6'0". The setup is a Pantheon Trip with Paris V2 150 with These ATF 327s and Zealous bearings. For campus cruising, I recommend highly. Stock 90a Divine bushings aren't so good, so I called up Tracey and asked about getting a Magnum/Canon combo. I've run wfb and aps in my past two setups and have been really happy with their performance, but never KranK. Eager to try out new stuff, I ordered 93a Magnums for my boardside and 93a Canons for my roadside. After two excruciatingly long days waiting for fresh bushings, I installed them into my setup, remarking the glove-like fit of both bushings into the bushing seats. And then I stepped on to my board. Words fail to describe how it felt, but I'll try. I think Neil Armstrong knows what I felt like, taking that first step on the moon, cause that's how good it felt. The rebound is epic. Truly amazing. Absolutely no slop, super precise lean. It feels like you stuck gummi bears into your trucks. Plush lean in, super lively back to center. Really great in Parises, but I'd imagine they're great on any raked truck. The strongest center in the world, I feel like I could take Teutonia on these trucks now. But they lean when you want them to. Every single person who's ridden this setup says it's amazing. I've even had people on my campus have me write down exactly what I was running so they could go home and copy it. Get these bushings if you want 1) literally the best bushings for Paris ever 2) really lively rebound 3) the best skating experience ever. Basically, buy them. Stop reading this review and go buy them. Shoutout to Brad and Tracey from Riptide, as well as ambassador Evan Dries for giving me the low-down on these. Shred safe!